Samsung’s new QLED TV offers plenty of entertainment options but the company wants you to pay attention to something else today. It wants you to check out all of the cool smart features that the new QLED TV’s One Remote Control has. The company says that this new remote simplifies the viewing experience whether you’re connecting to a gaming console or watching a movie on a Blu-ray player, the One Remote Control has the ability to control almost all media devices which eliminates the need to carry multiple remote controls. The One Remote Control also has auto-detection capabilities which take out the guesswork from toggling between devices. When you connect a device to an HDMI port the QLED TV will automatically detect the device and let users know what it is with instantly recognizable items and names like Xbox. The One Remote Control has an intuitive design, voice control functionality and just a few buttons. The dedicated Voice Recognition button easily lets users give the TV a voice command while the four-way button at the center of the remote control can be used to navigate all features easily. 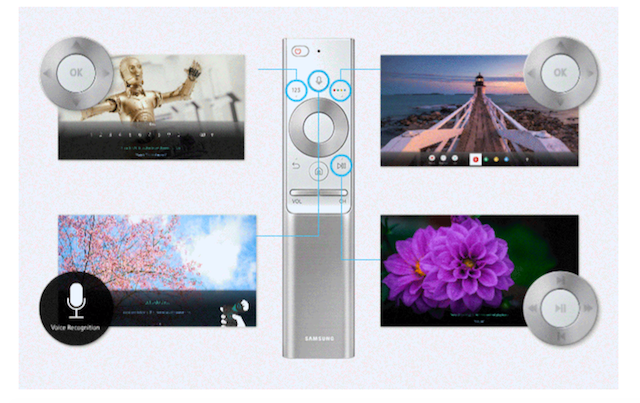 If you’d rather not use the One Remote Control, get the new Samsung Smart View app for iOS and Android. It lets you access all essential functions on your smartphone via an interface that’s like the one on your TV. This enables you to fiddle with the settings without blocking programming on the TV with menus and boxes. The app also allows you to view content like videos and photos stored on your mobile device on the big screen.